If journalist Anna had to write up the story of her own life, it wouldn’t make for a great headline: Dull Journo Has Dull Boyfriend! The only mystery in Anna’s life is that she’s never known who her dad is but with her mum refusing to tell her more she’s at a dead end. When she accidentally comes across a clue that her father is Italian, it opens up a burning curiosity in Anna. 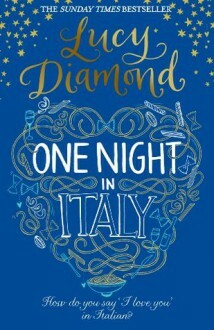 Soon she’s cooking Italian food, signing up for an Italian class and even considering dusting off her passport to go and find her dad in person… Sophie is serving gelato to tourists in Italy when she gets the call that her father has had a serious heart attack. In a rush, she grabs her well-worn backpack and heads back to the one place she’s been avoiding for so long – home. Living with her mum again while her dad recuperates, and taking a job teaching Italian to make ends meet, Sophie has to face up to the secrets she’s kept buried in the past. Catherine has no idea what the future holds. Her children have left for university, her husband has left her for another woman and her bank account is left empty after dedicating her life to raising her family. She needs a job and an identity all of a sudden. At an Italian evening class she makes a start in finding new friends Anna and Sophie. And she’s going to need good friends when she discovers her husband’s lies run even deeper than his infidelity… As Anna embarks on the trip to Italy that could answer all of her questions, will the truth live up to her dreams?